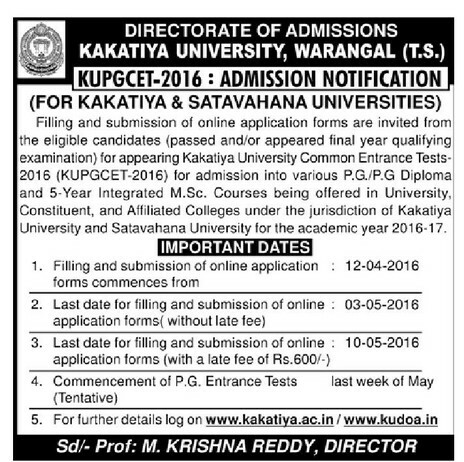 Kakatiya Univeristy invites the applications for PGCET 2016 KU PGCET 2016 Notification KUCET 2016 Online Application form,KU PGCET 2017 Notification KUCET 2017 Online Application formfrom eligible candidates,who have passed or appeared for the final year examination in the qualifying degree course for admission into P.G. Courses as listed in the brochure/website (www.kakatiya.ac.in) leading to Post-Graduate degree in M.A., M.Com., M.Sc., M.S.W., M.H.R.M., M.T.M., M.Ed., M.P.Ed., M.C.J., M.L.I.Sc. PG Diploma in Sericulture, PG Diploma in Clinical Biochemistry, 5-Year Integrated M.Sc. (Chemistry / Biotechnology / Pharmaceutical Chemistry), and M.Sc. (Nanoscience & Nanotechnology) KU PGCET 2016 Notification KUCET 2016 Online Application form,KU PGCET 2017 Notification KUCET 2017 Online Application formfor the Academic Year 2016-17 offered by University, Constituent, and Affiliated Colleges under the jurisdiction of Kakatiya University and Satavahana University through KUPGCET-2016. There shall be no entrance test for M.A. (Sanskrit), M.A. (Hindi), M.A. (Urdu), M.Sc. (Food Science & Technology), M.Sc. (MIT), and M.Sc. (Nanoscience & Nanotechnology). As such, the admission will be made based on the marks obtained in the qualifying examination at degree level. M.A. (Public Administration), M.A. (History), M.A. (Sociology), M.A. (Gender Studies), M.H.R.M., M.T.M., M.C.J., M.L.I.Sc., M.Sc (Microbiology), M.Sc (Bio-Chemistry), M.Sc. (Biotechnology), M.Sc (Geology), M.Sc. (Psychology), PG Diploma in Sericulture, and 5 year Integrated M.Sc. M.A. (Telugu, English, Hindi, Sanskrit, Economics, Political Science, Public Administration, History, Sociology Gender Studies. ); M.Sc. (Botany, Zoology, Chemistry, Biochemistry, Microbiology, Biotechnology, Physics, Mathematics, Applied Mathematics, Statistics, Geology, Computer Science, Psychology); Master of Human Resource Management (MHRM); Master of Tourism Management (MTM); Master of Social Work (MSW); Master of Mass Communication & Journalism (MCJ); M.Com. (M.Com; M.Com. (Financial Accounting); M.Com. (Banking & Insurance); and M.Com. (Computer Applications)); P.G. Diploma in Sericulture, P.G. Diploma in Clinical Bio-Chemistry; Master of Library and Information Science (MLISc); Master of Education (M.Ed. ); Master of Physical Education (M.P.Ed. ); and 5-Year Integrated PG Programme in M.Sc. (Biotechnology, Chemistry, Pharmaceutical Chemistry). Registration Fee: The registration fee for a single subject is Rs. 400/- for OC/BC candidates and Rs. 300/- for SC/ST/PH candidates. The registration fee may be paid at any TS/AP Online centers or through payment gateway (credited/Debit cards) / Net Banking .